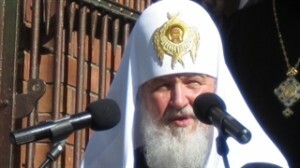 A three-day visit to Estonia by Kirill I of Moscow, the Primate of the Russian Orthodox Church, concluded on Sunday with the nation’s political and religious leaders, as well as the patriarch himself, tying the event to a reconciliation between nations and communities. Ansip expressed his conviction that Kirill’s visit was not only important for Estonia’s Orthodox community but for the state itself. The prime minister said that positive changes could be seen in Estonian-Russian relations and thanked Patriarch Kirill for contributing to them, according to a government press statement. Kiril also touched on the topic of relations, albeit more on a cultural than a political level, when speaking to the crowd of thousands who attended the consecration of the new Orthodox cathedral in Tallinn’s Lasnamäe district on Sunday. The patriarch expressed hope that the Estonian Orthodox Church would unite people of all nationalities living in the country, and noted that the institution was moving into an era of better times. “We see that those extremes that were reached in the 1990s are today being corrected by those including the Estonian authorities. And the fact that today we are praying with you in this magnificent church is a symbol that new times have come. And we thank God for these new times and hope that the Estonian Orthodox Church will thrive, bringing together Russians, Estonians and people of other nationalities, because what is decisive in the church is not national origin, but Christ and his commandments,” he said. Kirill concluded his trip with a meeting with Andres Põder, archbishop of the Estonian Evangelical Lutheran Church. Põder characterized the meeting as being crucial in a society where cross-cultural communication is lacking. “This is a good signal that people who are members of different churches, nations and cultures have the desire to understand one another. And if we can talk to each other and learn to empathize, then we will always find a common joy and willingness to work together. We all need this. We do not have enough communication and we need the ability to accept and respect each other,” Põder said.